NEW YORK, NY- The Florida Gators played against one of the top teams in the country on Tuesday night. 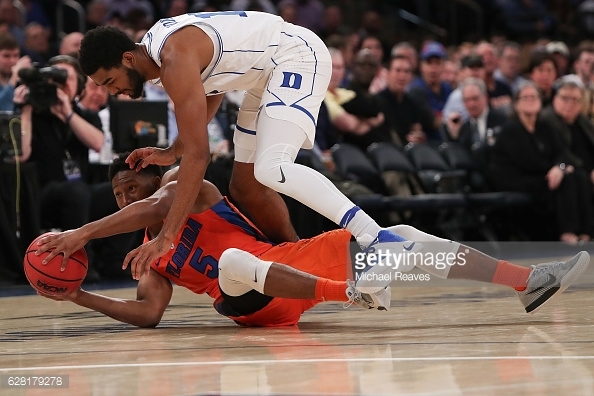 And for the most part, Florida went toe-to-toe with #5 Duke. Florida allowed the Blue Devils to shoot at a 53% clip, and made several turnovers during the stretch run in the second half that ended any chance of a comeback. Duke was led by Luke Kennard, who scored 29 points, and Amile Jefferson who added 24 points. The Blue Devils also got 22 points from Jayson Tatum off the bench. Florida will face Florida State on Sunday. FSU is 8-1 so far this season , and are coming off a 98-49 thrashing of Southern Miss, which saw the Seminoles hit 14 three-pointers.